They can live up to 25 years and in groups of up to 35. 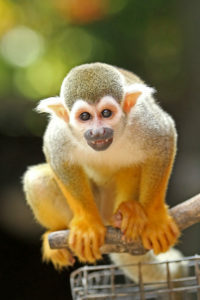 Squirrel monkeys inhabit most of the tropical rainforests in South America. Although the males and females of this species don’t have different colorations, the males canine teeth are larger than the females. Conservation Status: Habitat destruction, illegal hunting and capture all pose threats to this animal. Their status is listed as being of least concern. To mark their territories, squirrel monkeys will urinate on their hands and feet so when they swing from branch to branch, they will leave their scent behind.